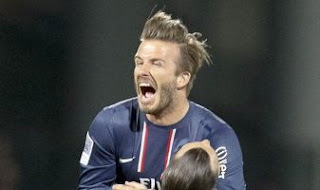 It has been reported that David Beckham has become the first Englishman to win the league in four different countries after PSG’s title triumph. The 38 year old former England international helped Paris Saint-Germain to a first Ligue 1 title in 19 years — to follow his success in the Premier League, Spain and the US. Jeremy Menez’s 53rd-minute strike was enough for PSG as they won 1-0 at Lyon. However, PSG’s title will not be confirmed until a league disciplinary panel meets to decide whether to impose a points deduction. It follows allegations Brazilian sporting director Leonardo barged a referee last weekend.